"Thor is the foremost of them, he that is called Thor of the Æsir, or Öku-Thor; he is strongest of all the gods and men... Thor has two he-goats, that are called Tooth-Gnasher and Tooth-Gritter, and a chariot wherein he drives, and the he-goats draw the chariot; therefore is he called Öku-Thor." - In parts of Europe a common house leek was grown into thatched roofs to protect against lightning. In the North this plant was called Thor's Beard. - At the base of Thor's hammer is an oath ring. In many Germanic cultures Thor was the keeper of oaths. It's the first time I was able to create an image of Thor that spoke deeply to me. I've been wanting to do a full color fantasy oil painting of Thor for a long time, and the drawing for the Voluspa led me to paint "Elemental Thor." In the painting I show Thor as a force of nature. He is the thunder, the tornado, and the storm. 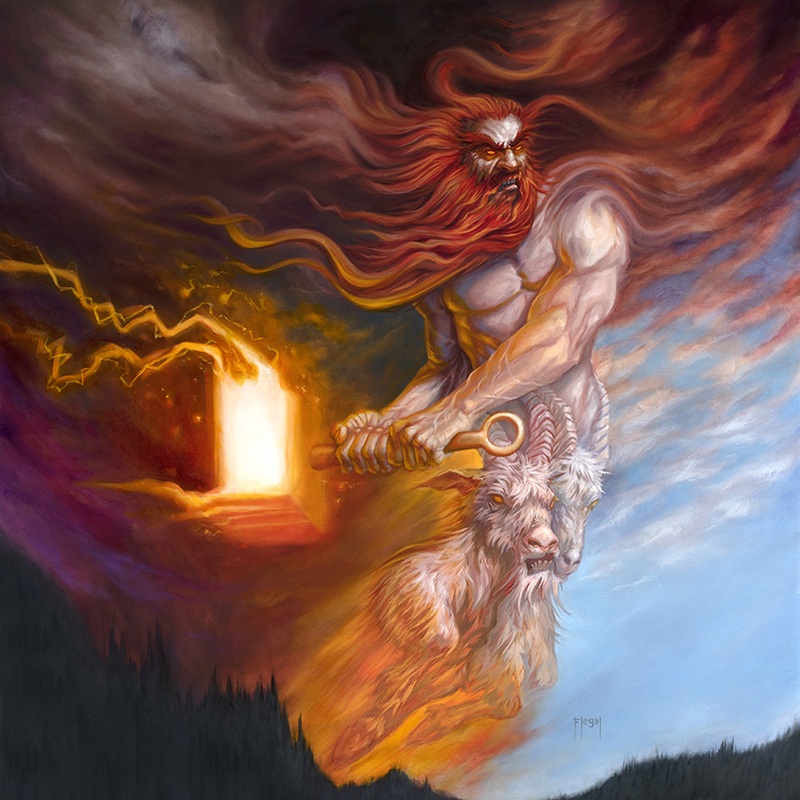 His goats propel him through the sky and his red beard blazes through the heavens, as he brings his lightning hammer to bear against the foes of Asguard. The original fantasy painting was done in oil and measures 36" x 36".